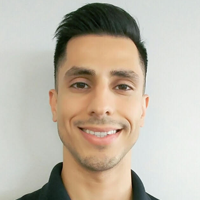 Omer graduated from George Mason University in 2012 with a degree in Exercise Science. He enjoys focusing on strength and conditioning concepts and cardiac rehab. While being a certified personal trainer and working in outpatient sports rehab, he went back to school to become a licensed PTA and provide more hand-on patient care. He is passionate about getting all patients to their goals whether it is to simply have less pain or to get back to their sport full-speed. On his personal time Omer likes to be outdoors and active as much as he can. He enjoys camping, and hiking and has recently gotten into obstacle course races completing the Spartan Race Trifecta in 2016.